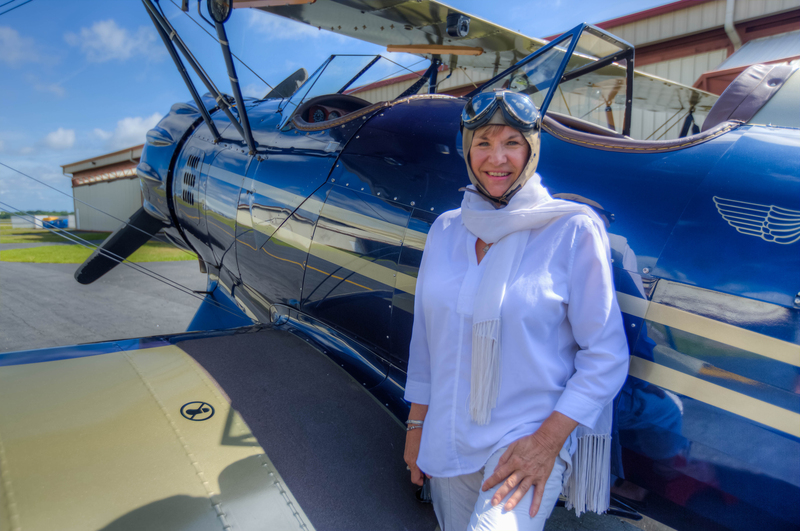 Old style leather flying helmet over my hair, goggles on my head, and scarf wrapped around my neck; I’m ready to take flight, feeling like Amelia Earhart and those 1920’s barnstormers. Pilot Dave Genet at the St. Augustine Regional Airport instructs me about the biplane and flight plan before explaining how to enter the open-air cockpit, “Step in backwards with the first leg and then slowly turn around as you lift the second leg.” Not my most elegant move, but I manage to nudge myself (with my thighs squished against my companion) in a compartment barely big enough for two. 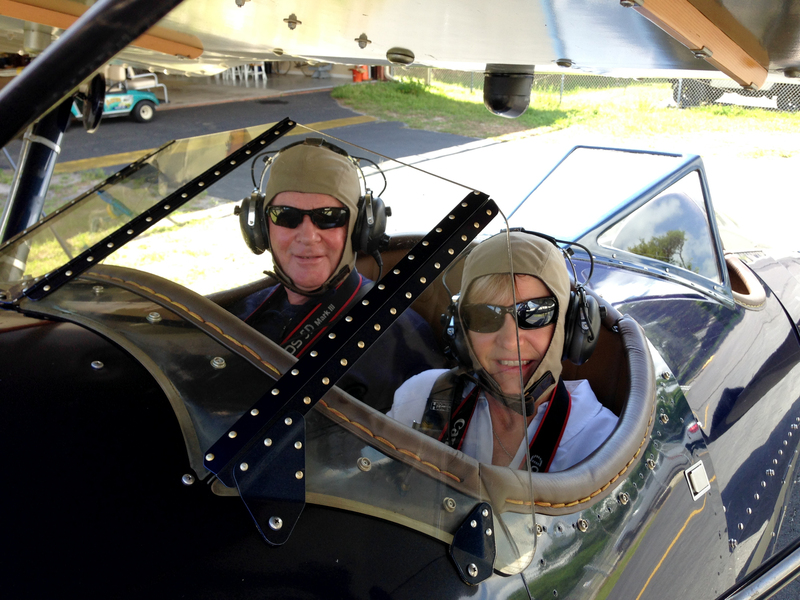 We both anxiously await the miracle of take off in a 1935 “Model” WACO YMF-5C biplane. The aeroplane, built in 2011, was hand crafted and designed to look and fly like the original. 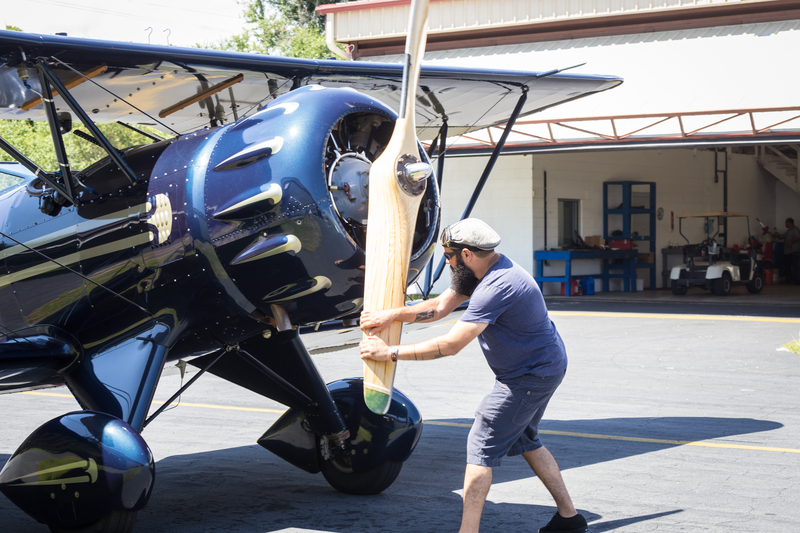 This beauty is the world’s only currently produced luxury 1935 Model FAA Certified Biplane, and Dave proudly shows it off. Plans call for a circuitous flight over historic St. Augustine, Florida; which just happens to be my hometown. Now seated, I don headphones that allow me to hear the control tower. Air traffic controllers clear us for take off and the flying machine lifts with ease, its feather-light wings made from spruce, and covered in Dacron. To me, aeronautics remains a mystery, but I am tingling with glee when everything works and we feel the wind beneath our wings. Pilot Dave Genet starts the engine. No wonder Amelia wore a cap – the wind is unceasing in the blue yonder at 80-100 miles per hour. Dave’s voice coming through the headphones is muted yet comforting. The struts or wing supports partially obstruct the view, but feeling of freedom and connection with the sky is glorious – remarkably different from sitting in a pressurized cabin of a jet. Positioned on the left-hand side of this plane, initially all I can see is the glare of rippling waves in the Atlantic. I soon catch sight of Vilano Beach though, then a few sunbathers on sandy St. Augustine Beach, and finally the iconic black and white stripes of the St. Augustine Lighthouse. Taking photos becomes a challenge, but I want to document the experience. When you twist your upper body to the side, a sharp blast of air hits you. Whoa – be sure to put the camera strap around your neck and restrain your sunglasses! Slowly, the plane circles around, and I get a heads-on peek at the Matanzas Inlet and my condo along the water. “Wow, there’s my place, the Bridge of Lions and Flagler College,” I yell, though no one hears me. The engine drowns out my voice. 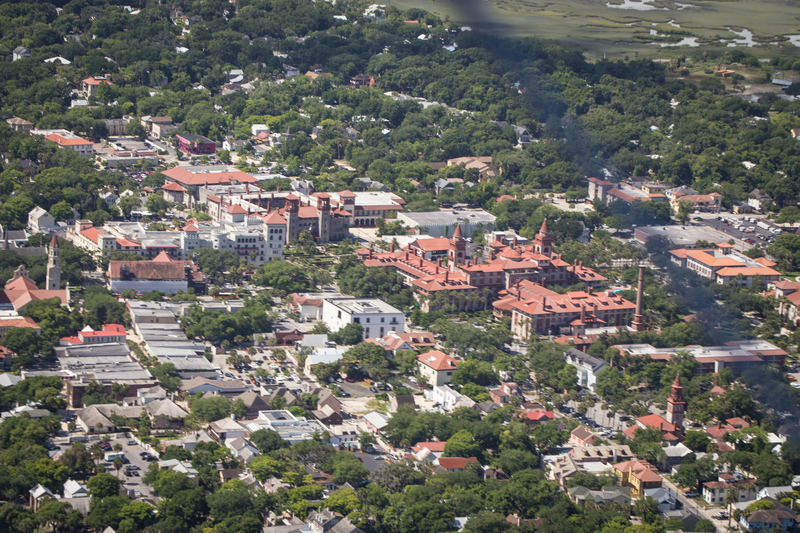 St. Augustine Historic District from the air. 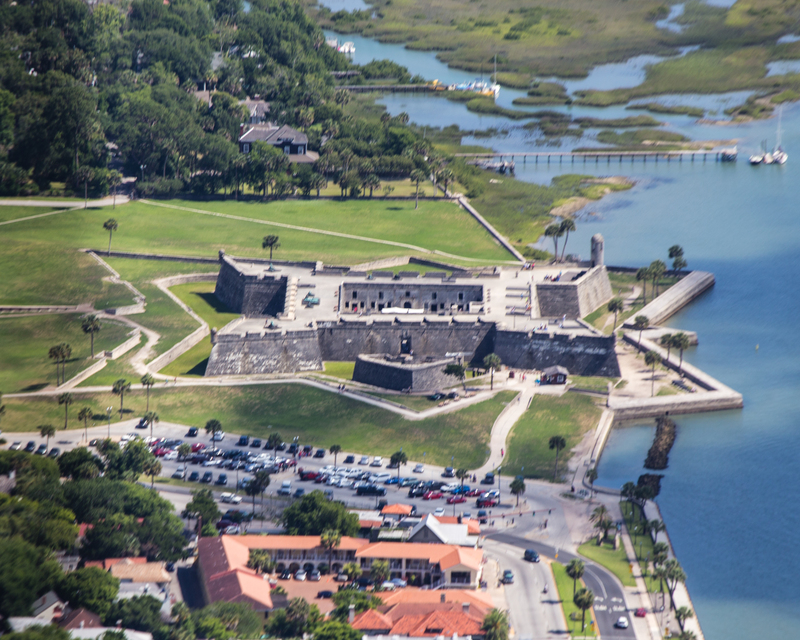 I was eagerly awaiting a glimpse of Castillo de San Marcos – the multi-pointed star-shaped fort. Once I see it, I’m giddy with delight. This vantage point is the only way you can appreciate the strategic architectural design of the construction. 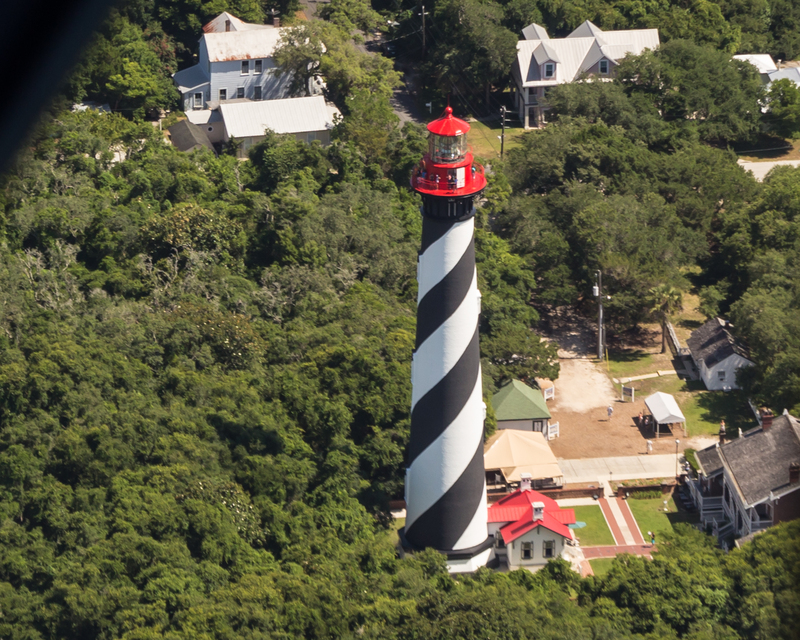 St. Augustine’s historic landmark is gorgeous from the air and worth the price of the ride. I want to linger, but introductory bi-plane rides only last about 20 minutes. From the air, the design of Castillo de San Marcos i s clearly visible. 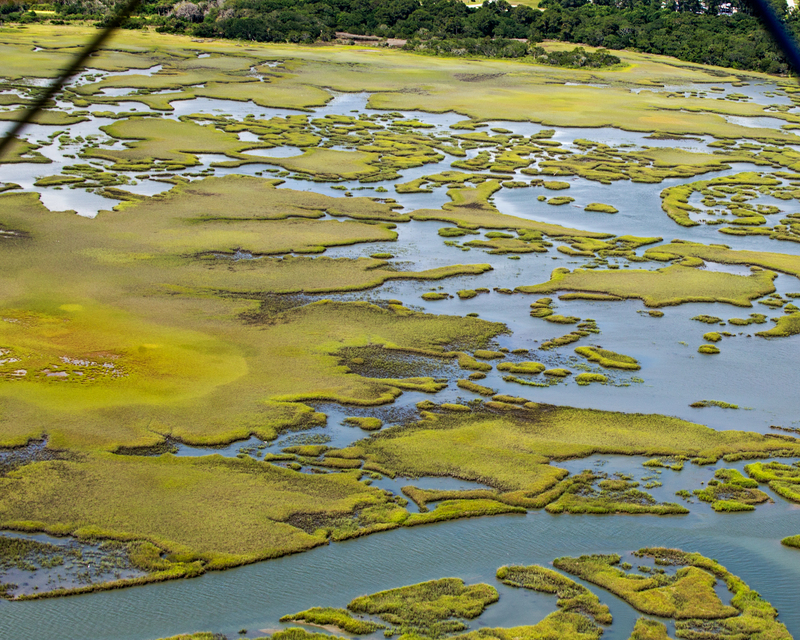 As we begin to head back toward the airport, we fly low over the estuary. The artful mosaic of the natural waterway strikes me – apparently nature knows how to create a masterpiece. Dave mentions how convective currents or downdrafts from the water and trees sometimes cause a bumpy ride. Who knew? I’m surprised to hear this, but always learning as it comes from experiencing new adventures. Before long we descend and roll down the runway. My first biplane ride is over way too soon. I could repeat this flight many times and be thrilled each time. Like Charles A. Lindbergh said, “Sometimes, flying feels too godlike to be attained by man. Sometimes, the world from above seems too beautiful, too wonderful, too distant for human eyes to see.” I must agree.